However, each MEP will be free to vote for or against anything. This week the political groups are just preparing their official recommendations, and given that the current version of the copyright bill resulted from a "trilogue" (interinstitutional negotiations between EU Council, European Commission and European Parliament), it's normal that the major political groups in the EP officially recommend to their MEPs that they vote in favor. That said, there definitely is a problem because southern European center-left parties are inclined to support the bill. Comparing the current situation to the one we faced in 2005 before the plenary vote on software patents, there's certainly a wider gap now. However, there will be massive protests on Saturday. In my previous post I provided a list of demonstrations (which has even grown since) and mentioned that I'm going to be one of the speakers at the Munich demonstration. Should those demonstrations have major impact, then there's still a chance that Merkel's Christian Democratic Union (CDU) and its Bavarian sister party (Christian Social Union, CSU) may prefer to avoid holding a vote so shortly before EU elections in May. The CDU and CSU delegation to the European Parliament has embarrassed and disqualified itself to the extent that no citizen could possibly trust them to understand the issues in the slightest. There are people in the CDU and CSU with a far better grasp of digital policy issues, but they're active in national politics, not in the European Parliament. The CDU/CSU (technically two parties, practically just one) is the largest political party in the largest EU economy. This is the leading German government party, and they're the most powerful party within the European People's Party (EPP), which in turn is the most powerful political group in the European Parliament. The current EPP chairman, Manfred Weber, is a CSU politician; his predecessor was a German-speaking Alsatian Frenchman, whose predecessor was a CDU politician (Hans-Gert Pöttering). That family of parties wields a big stick in EU politics, and a CDU MEP, Axel Voss, is the EU Parliament's rapporteur on the controversial copyright directive. As I mentioned in my previous post, I actually have a lot of compassion for what he's going through. I, too, have faced shitstorms because of pro-copyright positions I took in connection with Oracle v. Google (which were later validated by the Federal Circuit), but at least I wasn't threatened in that context (that happened to me, too, but because of my opposition to Oracle's acquisiton of Sun Microsystems). Article 13 doesn't mention filters, but high-traffic platforms can't practically meet its requirements without, at least not based on the wording of the directive itself (national implementations are a bridge that we'll cross when we get there). At the same time, Article 13 seeks to allow memes, remixes, parody, satire etc.--but as Mr. Voss conceded, automatic filters may end up overblocking. The sentence I highlighted above means to say that Google is, in Mr. Voss's observation, capable of electronically identifying memes. But while Google has special search modes (which one might compare to sections of a newspaper or magazine) for News, Images, Videos etc., memes aren't an "actual section" as Mr. Voss told Vice. "Memes" is merely one of literally (!) millions (across all languages) of keywords that Google identifies. If you find a keyword in an index of a book, it's just a keyword--and not the equivalent of a chapter. Given that Google doesn't provide a memes "section," German social democratic MEP Tiemo Woelken ("Wölken" in German) raised a legitimate question on Twitter earlier today. My translation: "I've just been looking for a #memes section on #google. Has anyone found it? 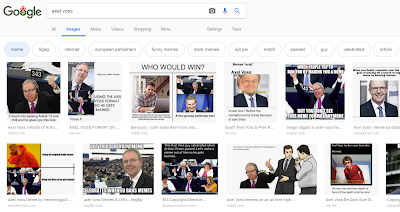 #Article13"
Google's search engine can filter out #memes pretty well. What you can see even on their screenshot is that "memes" is listed there as a keyword at a level with "buzzfeed", "leistungsschutzrecht" (= press publisher's right for news headlines), and "upload filter." 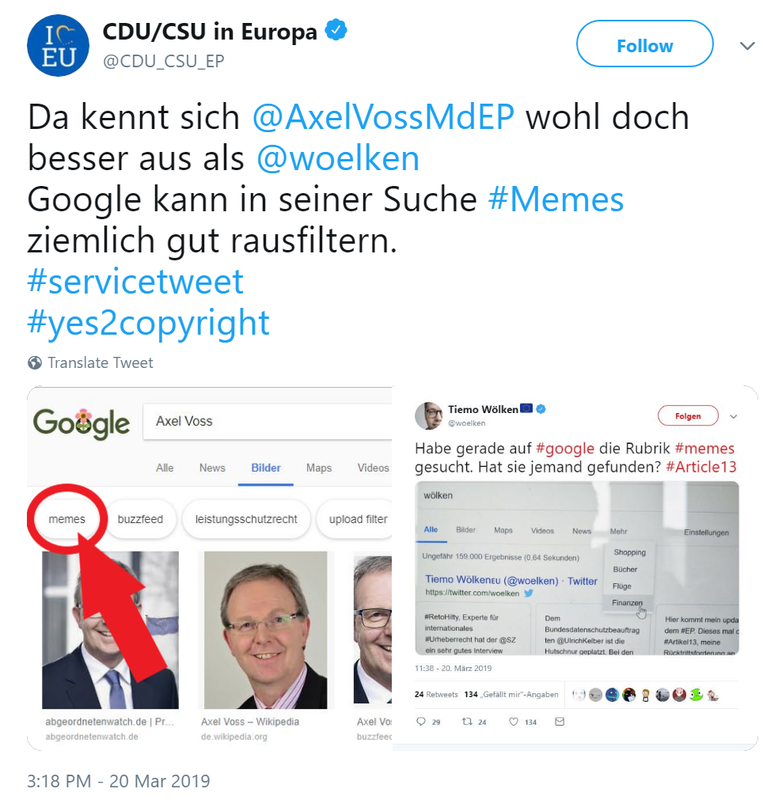 But the worst part is that the CDU/CSU chose to dig itself an even deeper hole by now claiming explicitly that Google's search engine can tell memes from other images that might have to be blocked by upload filters over fears of infringing someone's copyright. That is, of course, what Mr. Voss also meant in that Vice interview. The CDU/CSU delegation's tweet just makes it unmistakably clear how incompetent those guys are. An upload filter would have to--and in the foreseeable future, even with Artifical Intelligence, won't be able to--tell a meme from an infringing use of someone else's copyrighted picture. That is a substantive question that one could spend hours in court debating--per image. And in many cases, even reasonable people might disagree on whether the text someone put on an image is creative enough for the derivative work to constitute a "meme" that should be in the clear. It's technically far easier for the computer to recognize a substantial overlap between the bitmaps of the two images (the meme and the original photo), and on that basis it would have to err on the side of caution and block the upload. My screenshot makes it even clearer that "meme" is just a keyword. For "axel voss" Google also lists terms like "internet", "european parliament," or "celebrated." The first link ("Axel Voss, initiator of Articl...") points to https://www.reddit.com/r/memes/comments/9fhi3e/axel_voss_initiator_of_article_13_lets_meme_him/ and on that page the headline is "Axel Voss, initiator of Article 13. Let’s meme him into oblivion so he is censored by his own law." Also, various comments below the picture also contain the word "meme." The second link ("AXEL VOSS FORMAT SO ...") points to a site named "me.me" that is--guess what--dedicated to memes. On https://me.me/i/using-any-other-format-using-the-axel-voss-format-so-2bc17766802a4379964b57699e8f89be the word "MEME" appears at the top, in various combinations such as "Mecian Memes," "Gru Meme", or "I Don't Feel So Good Meme." Then there's a link ("Image tagged in axel voss me...") that points to https://imgflip.com/i/2k7e2f and on that page one can see that whoever uploaded it specifically checked the "memes" checkbox (top right corner); also the page says that this image was created with the "Imgflip Meme Generator." Then there's a link to memedroid.com, and the subtitle says "Axel Voss - Meme by Daba ...". The rightmost link in the upper row ("Eins der letzten Memes mi...") again contains the word "meme" (or, in this case, its plural) in the subtitle. ...and to the next one ("axel voss Memes & GIFs - Imgflip"). The third one in the second row ("EU Copyright Directive ...") points to knowyourmeme.com, and the word "meme" appears on the image (as it does in the one before), meaning that optical character recognition (which even the software that comes with scanners is typically capable of) would suffice to categorize the image accordingly, but that wouldn't even be necessary because of various simpler options (such as the URL). ...and also another link to me.me. The last one points to https://netzpolitik.org/2018/copyright-update-2-upload-filter-fuer-alle-ausser-google-facebook-co/ and involves an image that contains the word "meme" ("MEME-KULTUR IM INTERNET? NICHT MIT MIR."). Even in that case, Google didn't have to perform optical character recognition, though OCR is clearly pretty straightforward compared to a graphics-based distinction between memes and infringements. Even OCR wasn't needed because the URL of the image (https://cdn.netzpolitik.org/wp-upload/2018/02/meme-axel-voss-837x484.jpg) contains the word "meme" next to "axel-voss." By the way, the word meme is most likely also found in many, if not most or even all of the other cases, but in the previous cases I didn't even have to look at the image URL to figure out how Google managed to categorize those pictures as memes. This takes us full circle back to the upload-filter issue. An upload filter, especially in a situation where the only recommendation the layers could make is to err on the side of caution, couldn't rely on file names, subtitles, headlines, or other text found in the vicinity of an image. Otherwise end users could commit any kind of infringement by simply adding the word "meme" to a file name, a URL, an invisible tag, or by mentioning it somewhere on a web page, and the filter would have to accept everything on that basis. Google's keyword search can live with false positives for a keyword like "meme." An upload filter could not rely on keywords because users would find out very quickly about such loopholes, tell each other about this on the Internet, and the whole filter would become useless. 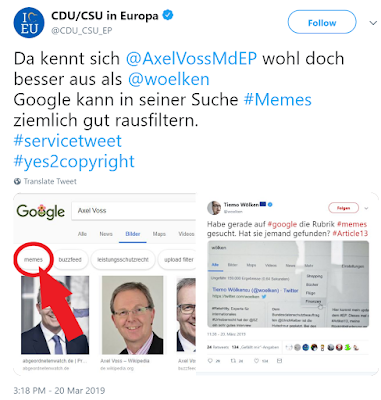 The CDU/CSU delegation to the European Parliament is undoubtedly clueless as to how computer software like Google's search engine arrives at its results. That's why Article 13 imposes requirements and obligations that no existing technology can possibly meet. But there is a high risk of a majority of MEPs rubberstamping something that's going to be unworkable. MEPs would be well advised to heed the reasonable concerns voiced by critics of Article 13. Even if one doesn't necessarily have to agree with all of them, there really are serious issues, and the problem is just that the EU with its well-known, longstanding democratic deficit is on the wrong track.